Kseniya Simonova's from The Ukraine. And here she is on Ukaraine's Talent Show. Here in our bowl, we rate her higher than that Boyle woman, but what do we know? We know we like drawing and we've never seen it done this way. 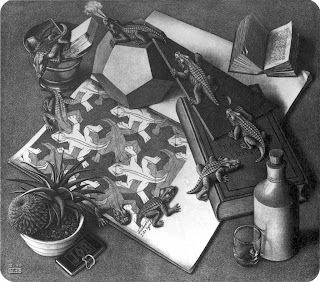 Both the image and the artist dances throughout. The text tells us that is a story of when Germany invaded the Ukaraine in WW2, but even without knowing that we were fascinated. If it is live, is it still animation? The Box Doodle project is a website that allows you to doodle on boxes and post them to the site. It's also a great inspiration for a rainy day. Grab those boxes and get doodling before someone else snags them! Sketch is fun website (click to open) where you can see how others draw. Someone draws a picture, and the site animates it so it is drawn before your eyes. Like magic! It also has tools to draw your own, and it's really simple. Lots of colors too. Give it a whirl! You have to add your name to access it, so check with your parents. I just kept hitting "random" and looked at many beautiful and funny drawings. 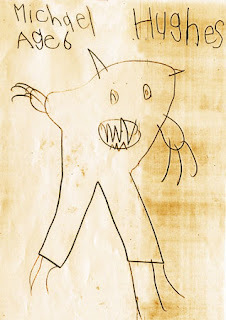 When I was a bit bigger than a wee boy, boy did I enjoy playing Exquisite Corpse. "What's that?" you say? C'mon you know: I draw the head, fold the paper over but continue the neck so the next player/drawer can see where to start; they draw the body, fold it over but continue so the last player/drawer can see where to start, and so on for the feet. I suppose you could do it with the entire class but we kept it to three generally. Maybe that had to do with the number of kids in our family. Anyhoo, Exquistie Corpse has come to the Internet, but with a much cooler name. Give it a play right here (click to link), and send it on to an email friend. Freak Machine will post once complete. The Champion Cartoonist Of All Time has got to be Windsor McKay. 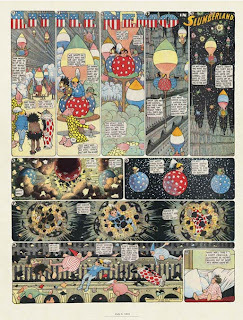 He created Little Nemo In Slumberland, Dreams Of A Rarebit Fiend, and Gerty The Dinosaur, to name but a few. He was one of the original pioneers of cinema and used to do a trick act where he performed live on stage as if he was training Gerty, who was actually nothing more than a filmed dinosaur. 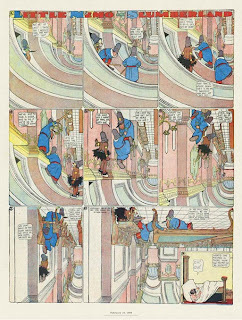 Little Nemo is hours upon hours of fun for any kid of any age. McKay drew with architectual precision. 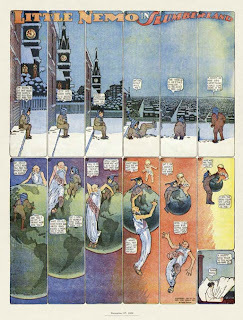 He had full page panels that would work equally well upside down as right side up. His imagination knew no bounds. We feel safe in saying that none of other hero drawers could do the work they have accomplished without him to pave the way -- so imagine how dull that world would be: No Miyazake, no Tex Avery, no David Weisner, no Chris Ware, and so on and so on and so on. There is a great collection of his work on-line at the Comic Strip Library. More Rinpa Eshidan noodling. What can I say? We'd give these drawers extra noses to come sit in the bowl. Okay, we admit: we've been BOWLED over by this Japanese doodling crew. Here they are watched from above. They give new meaning to "action painting". About two weeks ago we stumbled upon Rinpaeshidan, a drawing team in Japan. We can't get enough of them. There is something kind of magical on their willingness to draw on top of each other. This is a good idea they had: to make a four panel drawing that they can switch around the panels like a puzzle. Check out their website too for more good stuff. I think we will be seeing a lot from this crew. 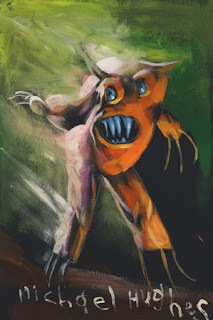 Dave Devries takes children's drawings and lends his artistic skill to them to give them a dose of spooky reality. He and his work would be in My Museum. Check it out.